Alright, it certainly seems easy enough. 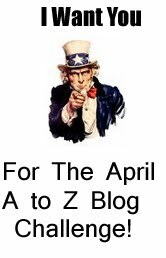 Write 26 blog posts to correspond with the letters of the alphabet for the month of April. Sundays are free days for good behavior. Well, I can look at this two ways. It will definitely jump start my blog. And second, it will get me writing more regularly again. While we did have a lot of assignments in Public Relations writing, I was starting to feel more natural about it. I think that “A” will be easy enough. It is April and Anime Detour is almost here. For the rest of the alphabet, you will just have to wait.